When two personas are better than one. With a newly found spring in its step, the hallway of the Step Down House becomes the hinging point connecting the original Federation front of house with a new open-plan arena. In the Step Down house, the original 1910 front rooms and architectural details of timber fretwork, cedar shingles and stained glass have been revived, while a poorly built 1970s lean-to rear addition was removed. 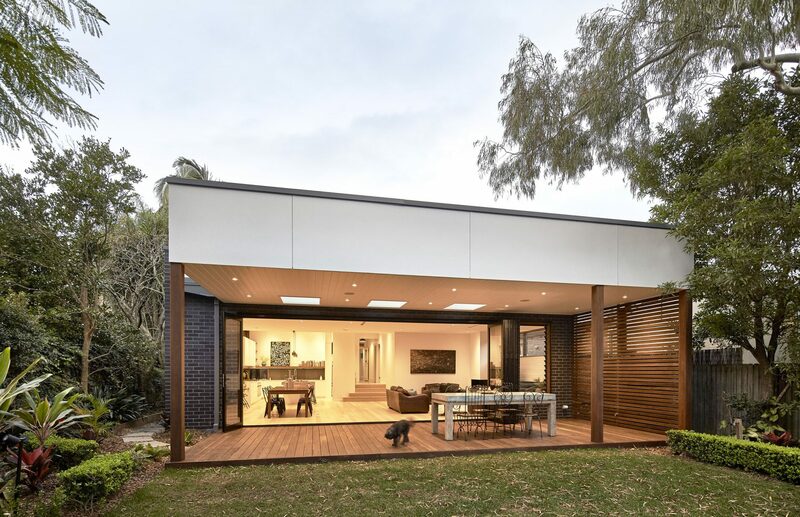 Our design strategy brought the new addition right down to the rear garden level, creating the opportunity for an airy pavilion of wide openings, high ceilings and flexible space. Tying the pavilion back to the house, the early Kauri timber floorboards have been whitewashed, while the pavilion’s dark brickwork is ‘stitched’ back into the original sandstock bricks in a mosaic effect. Glimpses of light and foliage trickle through the pavilion where a shiplap ceiling and whitewashed Tasmanian Oak floors lend a Scandinavian feel. The kitchen’s letterbox windows brings the side garden and sky pleasantly into frame, while skylights punctuate the roof above the deck. Perfect for our clients who love entertaining, the generous rear addition adds an expansive open living, dining and kitchen space and covered outdoor room, seamlessly transitioning from house to garden.